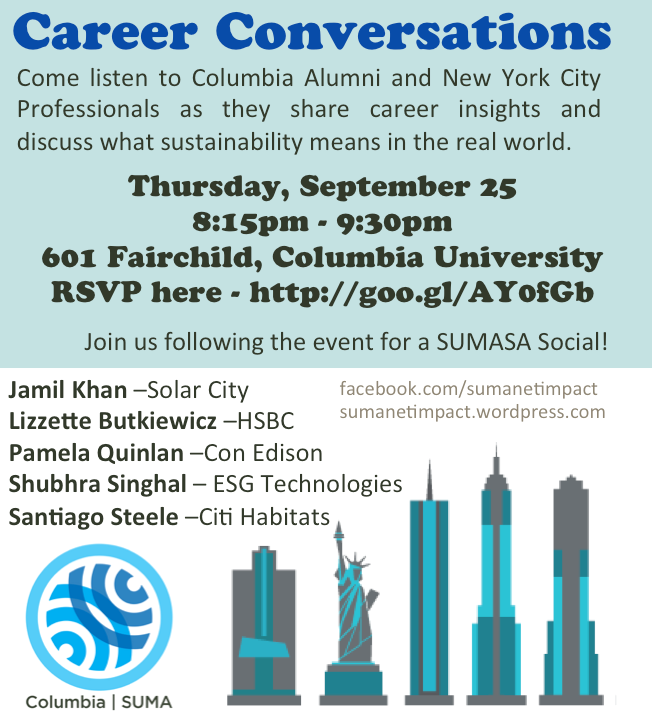 SUMA Net Impact is hosting its first ever “Career Conversations” event on Thursday, September 25th, featuring five speakers. Professor Satyajit Bose, Ph.D.: Professor of Economics of Sustainability, Green Accounting and Cost-benefit Analysis in the Master of Science in Sustainability Management program at Columbia. Read full bio. Moses Choi: Vice President in Morgan Stanley’s Global Sustainable Finance department, which supports investors and clients in the development of long-term sustainable business models and investment products capable of achieving financial, social and environmental returns. Prior to joining Morgan Stanley, Mr. Choi worked for several years at Citigroup where he was most recently responsible for strategy, deal origination and product innovation for Transaction Banking solutions contributing to financial inclusion and environmental sustainability. Read full bio. Professor Geoffrey Heal, Ph.D.: Donald C. Waite III Professor of Social Enterprise at Columbia Business School who is noted for his contributions to economic theory and resource and environmental economics. Read full bio. Professor Patrick L. Kinney Ph.D.: Director of Columbia Climate and Health Program. Professor Kinney’s teachings and research address issues at the intersection of global environmental change, human health, and policy, with an emphasis on the public health impacts of climate change and air pollution. Read full bio. Sal Lahoud: Co-founder and CEO of Pave.com a platform where individuals seeking funding and support connect with experienced people looking to invest in young careers. Mr. Lahoud is also the chairman of FCancer.org. Read full bio. The judges will be using a multi-dimensional scorecard to identify the winning idea that can successfully serve the needs of 25 million slum dwellers suffering from chronic diseases by 2019. The criterion includes how well the enterprise is aligned to the issue, how unique and potentially impactful the solution may be and how financially, technically, commercially and organizationally feasible the solution appears. Register your HultPrize@ Columbia team today! There are only a few spots left to participate in the first ever HultPrize@ Columbia competition. Register your team today through the Eventbrite page, by having one team member select a “participating team” ticket and entering the contact information of all team members. Learn more about the HultPrize@ Columbia competition. LEED, or Leadership in Energy & Environmental Design, is a green building program that has set out to transform the way buildings and communities are designed, built, and operated. According to the Department of Energy, LEED standards aimed at reducing water, waste, and emissions have helped building owners to reduce their energy use by as much as 25% while lowering their operational costs by as much as 19% compared to the national average. Join us for a tour of the Northwest Corner (NWC) Building led by Joseph Mannino, Vice President of Capital Project Management & Planning at Columbia University Facilities, to learn about Columbia’s commitment to LEED and how the process of becoming Gold-certified has contributed to better building design and performance at NWC. Also guiding the tour will be Adam Friedberg, the LEED consultant who participated in the NWC Building planning process, Janet Grapengeter, Director of Design and Compliance at Columbia Facilities, and Jessica Prata, Assistant Vice President of Environmental Stewardship at Columbia. Tour of a typical lab, possibly a mechanical room, the café, lecture hall, library, Pupin Plaza area and entry lobby, with attention to green design features and considerations, followed by Q&A time. Joseph is Vice President of Capital Project Management & Planning at Columbia University Facilities. With over 15 years of experience, Joseph has managed over $100 million in projects. He is a licensed architect in New York and New Jersey, and his previous experience includes designing institutional buildings and acting as an owner’s representative for the City University of New York. Adam has over 9 years of experience in sustainability, environmental engineering, and consulting for private, public, and non-profit clients nationally and internationally. His work includes implementing innovative sustainable planning, design and on-going maintenance strategies for buildings, infrastructure and urban and suburban master planning projects. A native of New York, Adam holds a degree in Environmental Engineering from Rensselaer Polytechnic Institute. Janet has more than 20 years of experience in facilities management and operations. Prior to working at Columbia, Janet served as National Director at Jones Jang LaSalle, as a Facilities Manager at P&G, and at the Brystol-Myers Squibb Co. She has a Construction Management diploma from NYU and a degree in Architecture from the University of Virginia. As the Assistant Vice President of Environmental Stewardship, Jessica is responsible for overseeing, launching, and monitoring sustainability efforts across the university in collaboration with students, faculty, and staff. Prior to her current role, Jessica served as the first-named Corporate Sustainability Officer at New York Presbyterian Hospital (NYP).